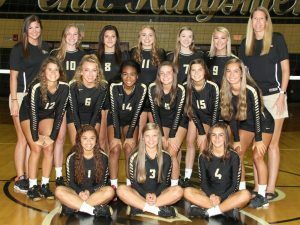 The Kingsmen varsity volleyball team defeated the Jimtown Jimmies, 25-15, 24-26, 25-8, 25-11, on Thursday, Sept. 7. Alyssa Torres and Rachel Rupert paced Penn’s attack with 11 kills each. Naomi Willis’ 32 assists helped to boost the lethal Kingsmen offense. Willis also contributed 22 digs on the night.